I'm a follower! And I LOVE Pink Lemonade! I would get the single silk rosette stretch headband in purple! I Love her. She makes me want to be a teen again. ;) Love the giveaway, now headed to shop! LOVE the turquoise and yellow rosette statement necklace. Adorbs. I would definitely get a couple of the bangle bracelets. so cute! I would buy the Rosette Trio headband in Yellow and the Amy Butler Printed Purple and Turquoise Rosette Stretch Headband. Super cute!! i'd get a statement necklace! I am a follower of your blog and LOVE it! I love me some pink lemonade! If I won the $25 credit for pink lemonade (I am also a follower of her blog!) I would buy a cute bobby pin, a rosette bangle bracelet and Im torn between a single rossette headband and a double rossette headband! I hope I win! I am a follower! Love you blog! I would absolutely get the Tripple Rosette Stretch Headband in Yellow! What a sweet giveaway, I love headbands!I'll be sure to check out her shop today. I am a follower, and I love love pink lemonade!! I would by the rosette necklace in grey, and the rosette ponytail holder! All so cute!! If I on the credit I would get one of the hair clips, they are very cute!!! 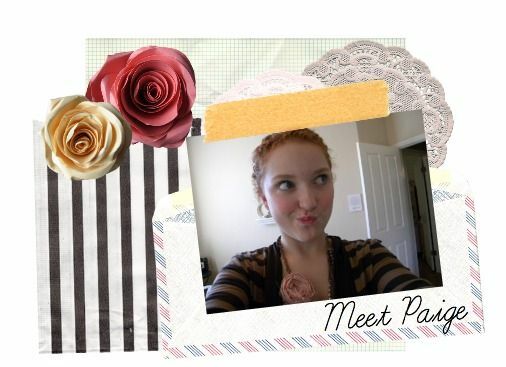 Im also a follower of Paige's blog and a big fan of her shop. Ive already purchased 3 items from her shop & have been very happy with them. Her prices are so affordable and she's a really good example to teen girls that have a dream & want to work hard to achieve it. I cant believe shes still a teenager! If I won(which I would really love to), Id pick out 2 more rosette bracelets as gifts for my sister in laws birthday. She loves the one I just ordered for myself! Love the turquoise and yellow rosette necklace! Wow! I'm so excited to have found her blog! I think I'm really going to enjoy reading it! I am so in love with the Single Rosette Statement Necklace! Its beautiful! I would get the rosette bangle bracelet, and would LOVE a rosette hair clip! :D Thanks for sponsoring Paige, your stuff is adorable! I am a follower - google reader and I love your blog ! thanks! I really love the triple rosette headband in yellow and the ponytail holders! I would definitely get the rosette statement necklace! In gray...of course! I would buy the Turquoise and Yellow Rosette Statement Necklace! I love your blog! Been a follower for a while. And I would get the turquoise and yellow rosette necklace. I LOVE those colors! I am a follower of your blog via Google Friend Connect. I would choose the Triple Rosette Stretch Headband. I love the turquoise and yellow rosette necklace and the triple rosette bangle bracelet in pink! i won i'd probably get the rosette statement necklace in orange to brighten me up! I am a follower and I love Paige! I think I might get one of her rosette necklaces in grey. I would definitely buy a rosette necklace with a shop credit. I already have a pair of earrings - I'd love to get a necklace to match! I think I would buy the Red Rosette Statement Necklace. I can always use more red accessories! I would buy that darling turquoise necklace! cuuuuutttteeee! aww i love everything paige makes! i'm a follower and i'm completely torn between the earrings and the stretch headbands. I follow and I love. turquoise is my favesie color. I follow and love this!!! Love me those bangle bracelets! I'd love a chance to win! I'm following both of you gals. I'd have to have a statement necklace for sure. Hmm..pink or aqua? So hard to choose! Both super sweet! I'd definitely order a rosette statement necklace! i would get the rosette bangles! how cute are they? the large rosette statement necklace caught my eye right away! i would definitely buy that! I follow your happy blog! Rosette bangles or a necklace would be lovely. the bangle bracelets and ponytail holders are my faves. um, how cute is this girl and her shop?! i follow your bloggy blog! love.it! i would grab the rosette statement necklace! presh! ooooh, i would def get that large rosette statement necklace, i love that one in gray. so pretty! I would LOVE the Rosette statement Necklace in pink, fo sho! (light pink or hot pink is the question:) Thanks for the chance! Just found your blog! I'm a follower! I'm a follower through my rss feed. she's a really good example to teen girls that have a dream & want to work hard to achieve it. I cant believe shes still a teenager!